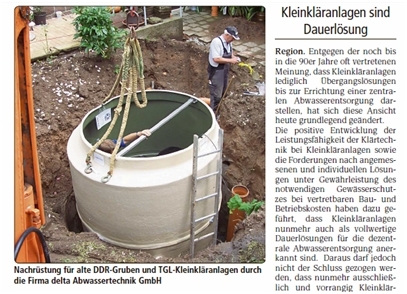 Delta Abwassertechnik offers sewage treatment solutions with a low carbon footprint- Meeting a wide range of requirements, from single house treatment plants to larger commercial and community developments, and any domestic dwellings without access to mains drainage. We are specializing in biological treatment plants – the most efficient and environmentally safe solution to residential sewage disposal needs – recognized by planning departments and environmental authorities as the preferred solution for domestic homes looking for an off-mains solution. Nearly 20 years of expertise and experience in this field speak only for itself – with the scope of our services spanning from: project concept and planning, to all facets of supply, installation, upgrading and maintaining the plants. As a company that recognizes the need of providing long-lasting solutions, we take pride in offering a highly effective level of sewage treatment – good enough to discharge into rivers and streams! Contact us today and tell us about your requirements!